Research on corruption has become increasingly important. All international organizations emphasize the fight against corruption, codes of conduct in this area are gaining increasing importance in the eyes of multinational firms, and donor aid is willingly offered for effective reform programs. But training qualified students in anti-corruption, has not yet actually started. This is a requirement which universities will have to face in the future by making "good governance" and anti-corruption reform part of their programs. 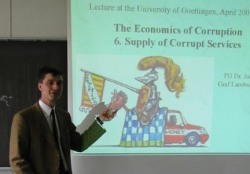 PD Dr. Johann Graf Lambsdorff, assistant professor at the University of Goettingen, offered a lecture in the economics of corruption at his University in April 2001. He is the creator of the Corruption Perceptions Index which is annually published by Transparency International. An announcement via internet was sufficient to attract an international audience. Although students had to find their own support to finance their travel, the participation was overwhelming - a clear signal for the attractiveness and necessity of such a course. By writing a final exam students from Goettingen collected credit points towards their degrees, e.g. towards a Master's of Art in International Economics. 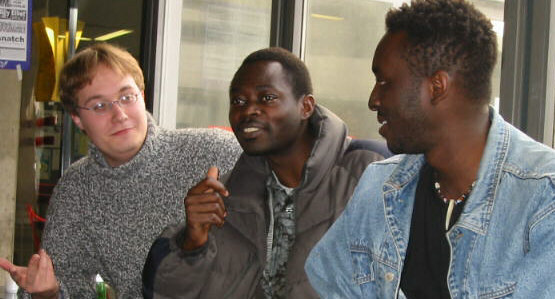 Foreign students came from all continents: Peru, Philippines, Cameroon, USA, Turkey, Tanzania, Japan, China, Poland and Slovakia - they too could take home credit points for the course. The lecture course lasted one week, and comprised an intensive program including definitions, causes and the quantitative measurement of corruption. Formal models were applied to shed light on the problems of competition for preferential treatment by public decision makers and the theoretic consequences to welfare of self-seeking among government officials. The calculus of corrupt actors was analyzed as well as the design of corrupt agreements and the transaction costs involved. Classical economic methods were applied hand in hand with more recent approaches such as the economics of criminal conduct, public choice and new institutional economics. Focusing on case studies helped to illustrate theoretical conclusions and provide a vivid real-live impression of the subject. Many participants enriched the course with their contributions and small presentations, for example with regard to the latest corruption scandals in Peru and the Philippines. Participants repeatedly remarked on how touched they were by the good atmosphere made possible by an international audience. 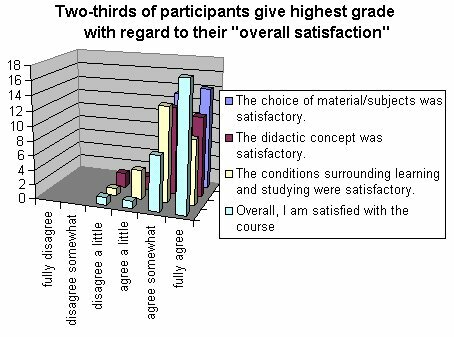 In an evaluation of the course, two-thirds of the participants gave the highest possible grade with regard to their overall satisfaction. Time was too short, certainly, but contacts will continue via the internet for the participants and, hopefully, an update of the course will be offered as soon as possible. impressum Innstr.27 - 94032 Passau - Germany - Fax: +49(0)851-509-2492 - last change 2006/03/14, 14:14.